The CIA believes a Pakistani tribal leader's network was behind the assassination of former Pakistan Prime Minister Benazir Bhutto, according to U.S. intelligence officials. Baitullah Mehsud is an extremist with strong ties to al Qaeda and is based in the federally administered, lawless tribal area of Pakistan, along the Afghan border. He has been blamed for an organized campaign of assassinations of Pakistani officials and suicide bombings in the country. The CIA arrived at the conclusion that Mehsud was behind the Dec. 27 killing of Bhutto shortly after it occurred, according to an intelligence official who spoke on condition of anonymity because of the sensitivity of the matter. The Washington Posts first reported the CIA's take on Friday, in an interview conducted with CIA director Michael Hayden. "This was done by that network around Baitullah Mehsud. We have no reason to question that," Hayden told the Post. The government of Pakistani President Pervez Musharraf has blamed Bhutto's death on Mehsud, but some of her political party and family members have questioned those assertions. There have been complaints that the government failed to provide her enough security and vague allegations that elements within the government might have been involved in the assassination. 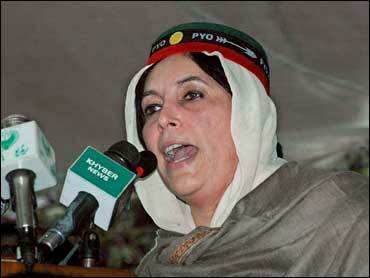 Bhutto was a secular politician popular in the U.S. and other Western countries for her opposition to hard-line Islam. Mehsud has denied involvement in her death.